Winship Gala awardees Drs. Rita Nahta, Khalid Salaita, and Ya Wang. Three Winship Cancer Institute investigators will receive well over $110,000 in funding for cancer research projects made possible through generous donations to last month's 2018 Winship Gala. The awards are part of the Winship Invest$ peer-reviewed program which has distributed nearly $10 million since 2010 to fund close to 230 novel, innovative cancer research projects. Ya Wang, PhD, professor in the Department of Radiation Oncology, will study GPRC5A, a mechanism which prevents lung tumor progression. Her award comes from a donation from Delta Air Lines. 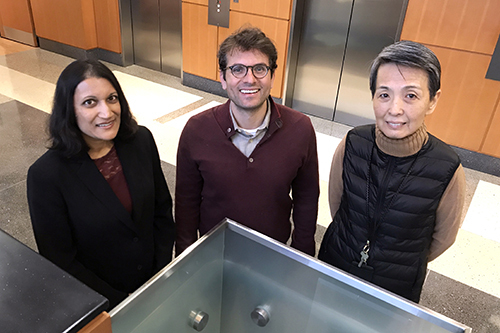 Rita Nahta, PhD, assistant professor in the Department of Pharmacology, will investigate mechanisms of immune modulation by the inflammatory cytokine GDF15 in breast cancer. The award was provided through a donation from the Brenda Nease Breast Cancer Research Fund. Khalid Salaita, PhD, associate professor in the Department of Chemistry, received an award from the Home Depot Foundation to investigate targeting KRAS-dependent lung cancer using DNAzyme Nanoparticle Conjugates.